Richard Aldington, the British author of the Great War classic Death of a Hero, wrote in 1930 “I see many death worshippers in the world, but Herr Junger is certainly an almost unrivalled fanatic in the idolatry of destruction” (quoted Nevin, 40). By 1930, Junger had published five autobiographical books about his experiences in Germany: In Stahlgewittern, privately published in 1920 and then taken up by E.S. Mittler of Berlin in 1922 and (2nd edition) 1924; Der Kampf als Inneres Erlebnis (Battle as Inner Experience) was published by Mittler in 1922; Sturm was published in instalments in the Hannoversche Kurier in 1923, and not published in book form until 1975; Das Wäldchen 125 (Copse 125), dealing with trench battles in 1918, was published by Mittler in 1924; and Feuer und Blut (about the offensive of 21 March 1918) was published by Stahlhelm in Magdeburg in 1925. Aldington’s comment is to be found in his review of Copse 125: it is generally agreed that Junger glorified war much more openly in the books that came after the initial In Stahlgewittern. There is a question, of course, as to how accurate the factual material in any of these books is. It looks as if Jünger himself tried to make In Stahlgewittern appear more objective. It originally appears with the subtitle From there Diary of the Leader of Assault Troops; it was shortened to A War Diary in later editions; and on 1961 the author dropped the subtitle altogether. Loose commented that although in his collected works the author included this work among his various published diaries, it really only deserves this label because it was based upon his record of events: “It is an autobiographical novel since the protagonist is the author himself describing the interplay of the supra individual event and an individual’s fate” (24). When Germany first mobilised for war, Jünger was at home, but his parents were at the seaside. Jünger went into Hanover, and in Erst August Platz her say women garlanding the troops as they marched by. Since then, I have seen many inspired crowds, but no inspiration was deeper and mightier than on that day. It was an impression of blood, roses, and splendid tears that went to the very core of oneself (quoted Nevin 43). He joined up, and from October to December was trained in the reserve battalion of Hanover’s 73rd Regiment. We had left lecture rooms, school benches, and work tables behind and in the short weeks of instruction we’d been melted together into a great, inspired body, the carrier of German idealism since 1870. Grown up in a materialist age, we all longed for the unusual, for great danger. The war had gripped us like an intoxicant (quoted Nevin 44). He went by train to Bazancourt, just ten miles north of Reims and close to the trenches. On 24 March 1915 the 73rd joined the 76th and 164th as part of the 111th Infantry Division. On 12 April the 73rd went south to Lorraine. Exhausted, he fell asleep in the grass; when he woke up in the morning he realized that he was surrounded by the decomposing corpses of the French who had died the previous year. A little while later he is shot in the thigh: the first of the wounds he received during the war (somewhere between seven and fourteen, depending on the source) (see Neeman 26) After two week’s recovery, he was sent to Döberitz for officer training. He rejoined his regiment at Douchy-les-Ayette, south of Arras: thirty metres away were Indians from a Leicestershire regiment. On 29 November 1915 he was promoted to lieutenant, and received more training. In the summer of 1916, Jünger was at the receiving end of the British assault at the Somme. Literally, in the sense that he was wounded three times: shrapnel on the left side, a bullet through the right calf, and a bullet (from a comrade’s pistol) grazing his skull. When the Germans withdrew from their lines in March 1917, they destroyed everything in the area they had held. They found with demolishing acuity the main girders of houses, attached ropes and pulled with rhythmic crises of great effort until the whole thing collapsed. Others swung mighty hammers, smashing whatever came in their way, from flower pots at window ledges to the artful glasswork of greenhouses. As far as the Siegfried line every town was a pile of ruins, every waterway dammed, every cellar exploded or made deadly with hidden bombs (quoted Nevin, 52). On 31 July 1917 the British opened up the Third Battle of Ypres (Passchendaele). Jünger was commanding the Seventh Company, a rifle unit. By chance he comes across his badly wounded brother Friedrich-Georg (Fritz); Fritz was equally surprised, as he had heard that Ernst had been killed the previous day. In late August he was transferred to Lorraine, where he was again wounded in the course of an assault on the French. He lost most of his platoon of men, and was reprimanded by a staff officer: an episode which confirmed him in his contempt for those who inherited their position rather than earned it. Jünger’s company of eighty men were situated on the edge of the British tank assault south-west of Cambrai on 20 November 1917. (The British made no lasting gains, largely because their infantry failed to keep up with the tanks.) Jünger’s men, well positioned and well-commanded, surrounded and captured a British force three times the size. 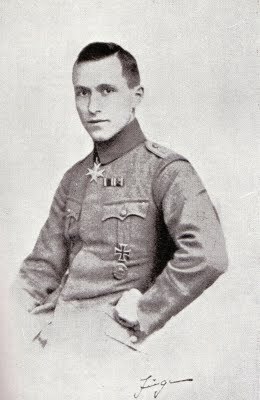 Jünger was wounded (a bullet went through his helmet) but he received a medal and other rewards, including two weeks’ leave. On 21 March 1918 Ludendorff attacked between Arras and St-Quentin. By the end of the first day Jünger had only 63 men left out of the 150 he had started with. In the night a shell made a direct hit on the trench, and totally disoriented Jünger, who ended up on the ground in tears. Nevin makes the point (58-59) that for all Jünger’s bombast and for all his blood-thirsty language, his narrative betrays not infrequent examples of humanity, and signs that the truth is emerging at times from the rhetoric. For instance, he sees an orderly shooting English captives with a pistol, and watches in a numbed state, like that of a spectator, he says, in a theatre. One chill evening he takes an English officer’s coat, and steps out wearing it; he is shot in the chest (probably by one of his own men) and then is knocked unconscious by shrapnel from a shell blast. After recovery, he takes over the 7th Company again on 4 June 1918. He is ordered to defend a small wood 20 km south of Arras. For the British it is Rossignol Wood; for the Germans it is Wäldchen 125, Copse 125. This is the field of action for Jünger’s book of that name which, as Nevin says (63) “approximates the ‘undefeated in the field’ apologetics of Germany’ postwar officer class”. There was no great battle; merely a long struggle to survive. Copse 125 shows how Jünger came to realise that there was no more room in modern warfare for man-to-man combat or chivalric enterprise. Destruction was not done by the individual, but by massed machines. But there was one place where chivalry still held sway: he goes to an air base and meets fighter pilots. Battle is their great passion, the joy of challenging fate, of being fate. This thy sense when, after the takeoff, they thrust themselves into uncertainty—a roaring flight of birds of prey. When they fly at heights from which the front lines are invisible to them as no more than a thin network, and the fighters in the trenches as a mere string of points—then, in this venture of theirs, the fiery union of the spirit of ancient knighthood and the cold austerity of technology is consummated. It is granted to them to do battle with the world’s best fighters in a new realm, in the sky hung with clouds. It is a deadly joust within whose lists there is only victory or the fatal plunge (quoted Loose, 25). On August 24, Jünger was knocked over by a bullet that went through a lung. He saw enemy troops coming and, for the first time, saw German troops with their hands up. When two British officers arrived gathering prisoners, he shot one dead. As he was being carried out on a stretcher, one stretcher bearer was shot dead, and an NCO who was attending him. But he reached medical help, and he was sent back to Germany for recovery. On 22 September 1918 the Kaiser personally presented him with the Pour la Mérite, the highest order of the German army. As Nevin notes, the first edition of In Stahlgewittern (1920) ends with a morphine injection and hospital. In the first revised edition (1926) he adds a list of all his wounds: six hits from rifle bullets, one from a shrapnel bullet, one from a shell splinter, three from grenade splinters, and two from the splinters of rifle bullets (Nevin 62). But in 1926 he also adds a good deal of patriotic fervour, about being bound to the land through blood shed in battle, about life only having deeper meaning through sacrifice, and so on. In this edition, the book ends “Germany lives and shall never go under!” But this nationalist rhetoric is deleted in the 1934 edition. By then, the Nazis own the rhetoric of nationalism, and Jünger wants nothing to do with them. Before he has fully recovered from his wound, the war comes to an end. He returned home. Jünger studied his father’s pharmacological library, wondering what overdose to take. Instead, he turned to opium (he experimented with drugs a good deal in later years). Early in 1919 he enlisted in Hanover’s new 16th Reichswehr Infantry Regiment. He found himself studying French military manuals in order to edit the army’s regulations. He confessed to his brother in November 1921 that he felt out of place in the army now, and stayed on only because outside the army everything was so confused (quoted Nevin, 78). He resigned from the army 31 August 1923. For my bibliography, see in the other Jünger entry.